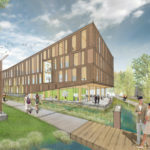 The University of Massachusetts (UMass) Amherst, about 100 miles west of Boston, will get a new multidisciplinary addition this fall. Boston-based Leers Weinzapfel Associates designed the UMass Design Building, set to open November 2016 in time for winter classes. 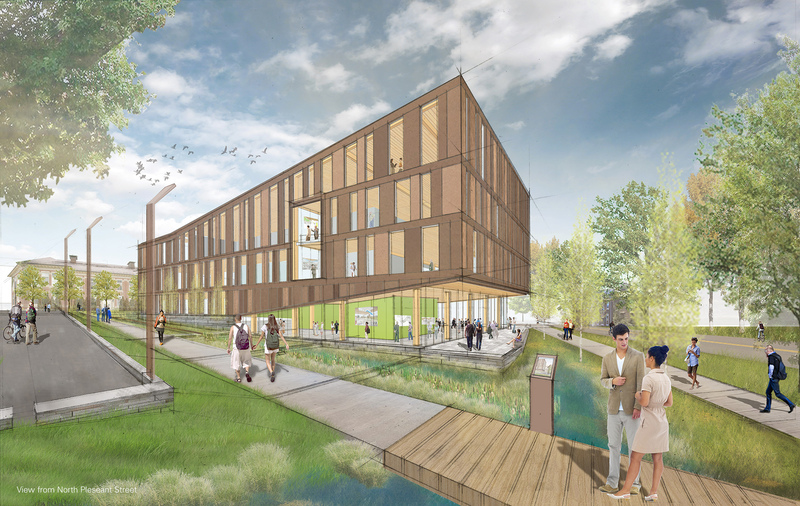 It will unite the architecture, landscape architecture, regional planning, and building technology departments into one facility. 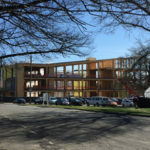 The building is currently under construction. 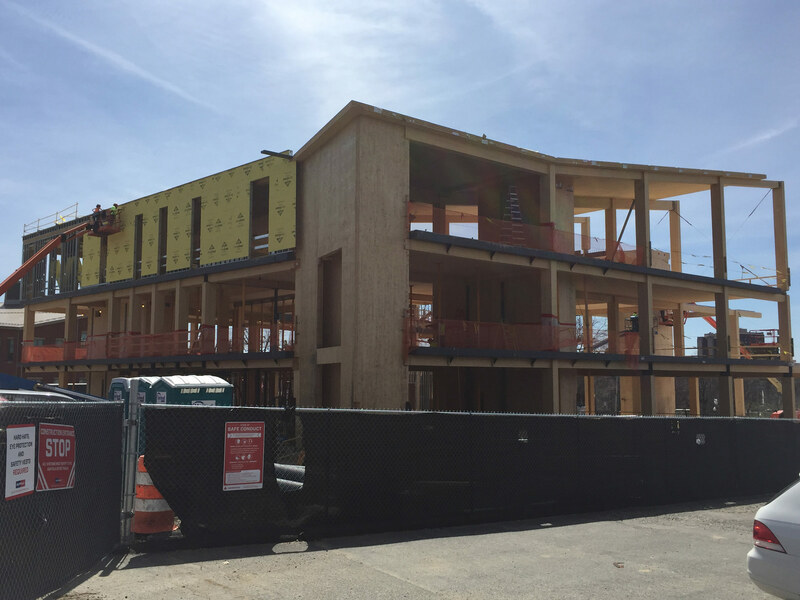 See our slideshow above and images below for exclusive construction photos (we’ve included a few renderings, too). 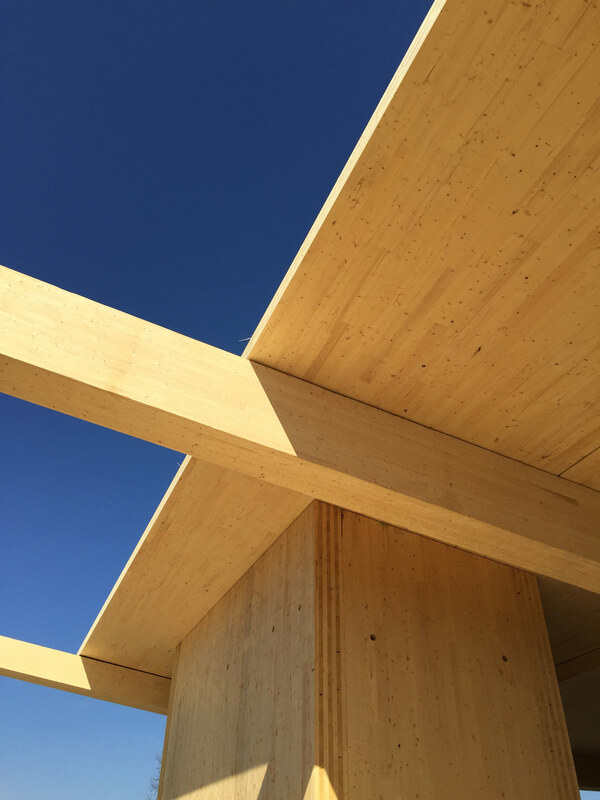 When the project opens, it will be one of the largest mass timber structures in the United States. 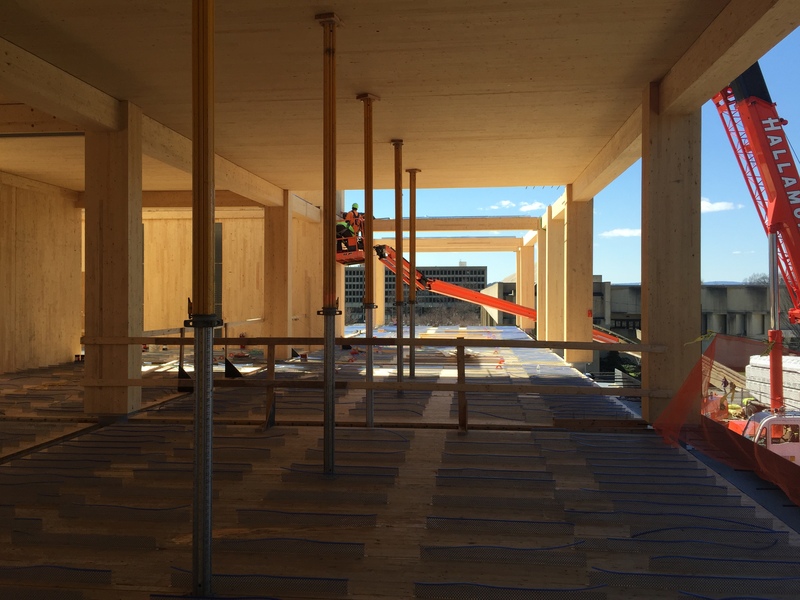 The building’s interior will feature Cross Laminated Timber (CLT), an engineered wood known for its durability and lightness. Projects can use CLT to replace materials with higher embodied energy such as steel, concrete, and masonry. 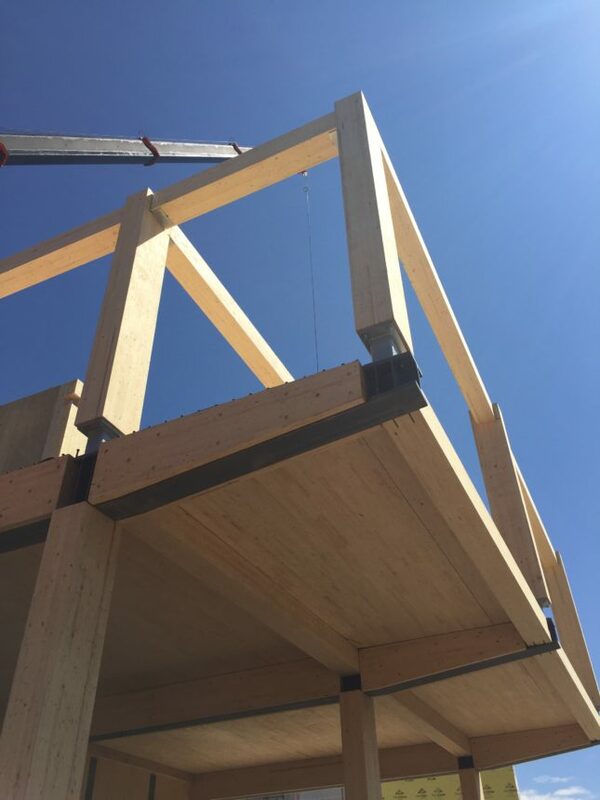 While it has been popular in Europe and Canada for some time, CLT is gaining traction in the United States, mostly on the west coast (one notable project is the Bullitt Center in Seattle). 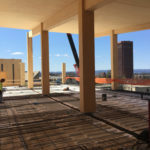 The 87,000 square foot Design Building will also rely on a glue-laminated wood frame, a wood composite floor, and a copper anodized aluminum building envelope. 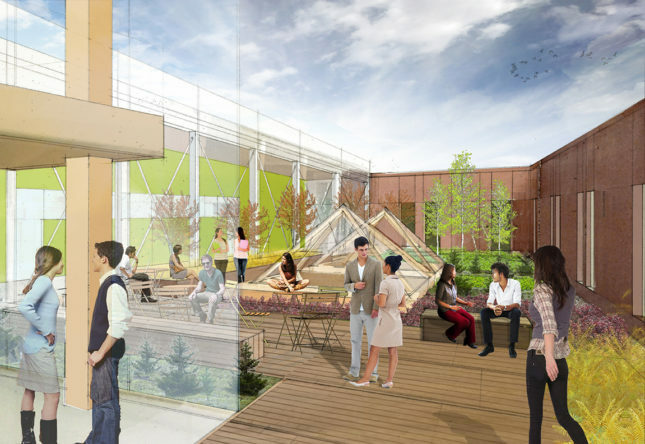 The facility will bring together over 500 students and 50 faculty across the four departments into a space that is transparent, open, and light-filled. 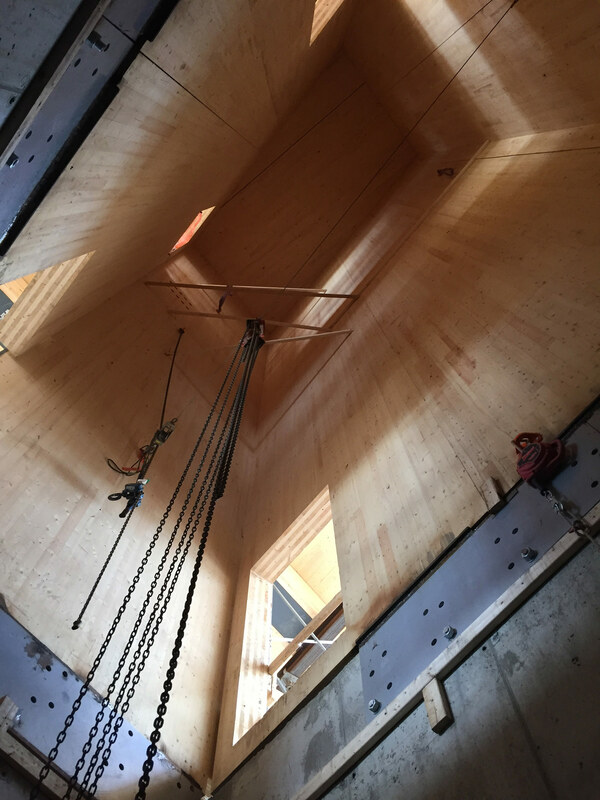 The design features a lowered atrium with a zipper truss, an upper courtyard, and offices and classrooms rising in a coil, explained Andrea Leers, principal and co-founder of Leers Weinzapfel Associates. A major goal of the design was to help facilitate greater interaction between student and faculty. 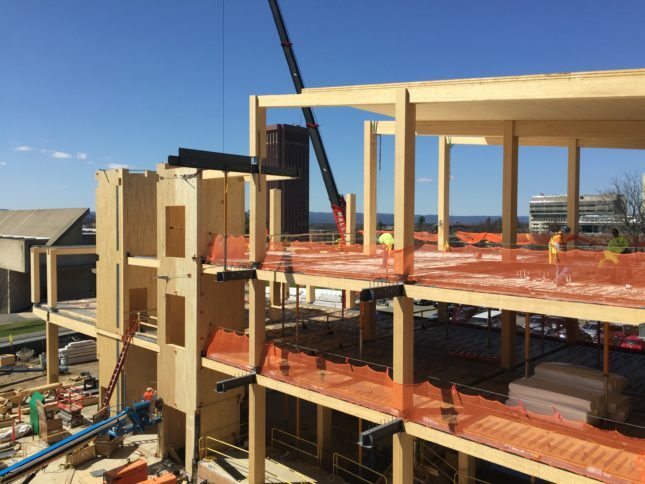 The firm put studios and offices on each floor, said Tom Chung, principal at Leers Weinzapfel. Yet there is also an element of independence, as studios on each level are at one end, while offices are at the other. 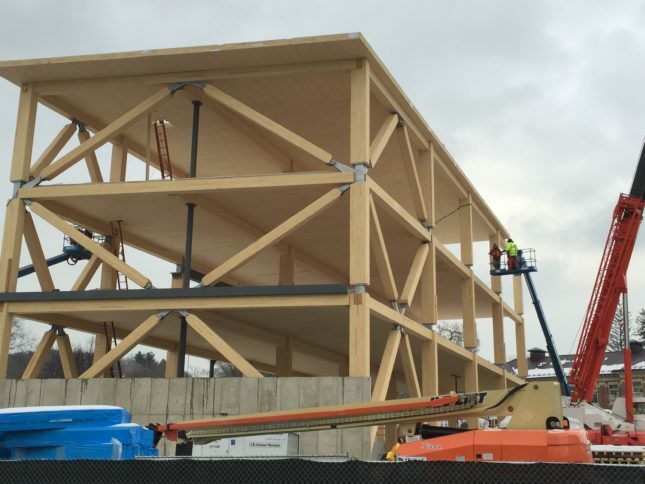 The studios will be medium-sized, able to fit up to 5 sections. 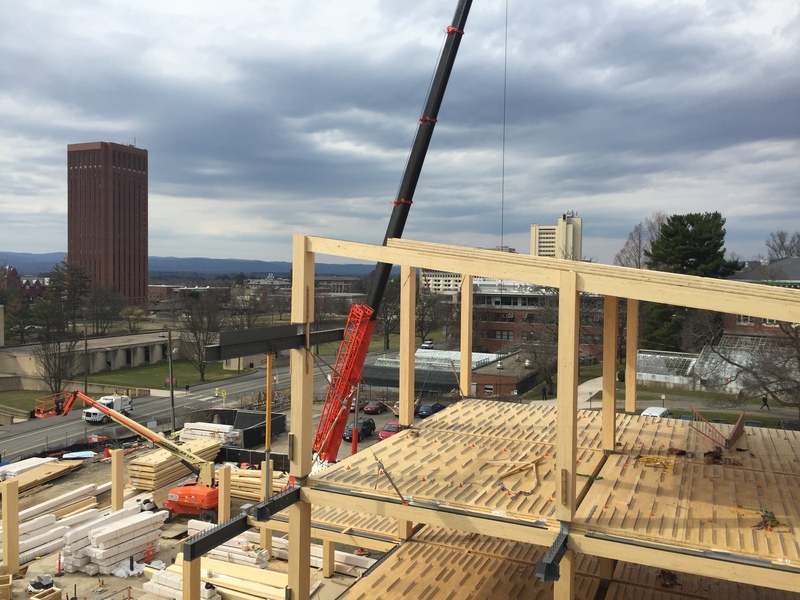 “UMass did not want a lecture hall,” Leers said. Instead, the ground floor—which has no predefined programming—includes stairs that double as seating for presentations and a flat floor for absorbing activities and other events. 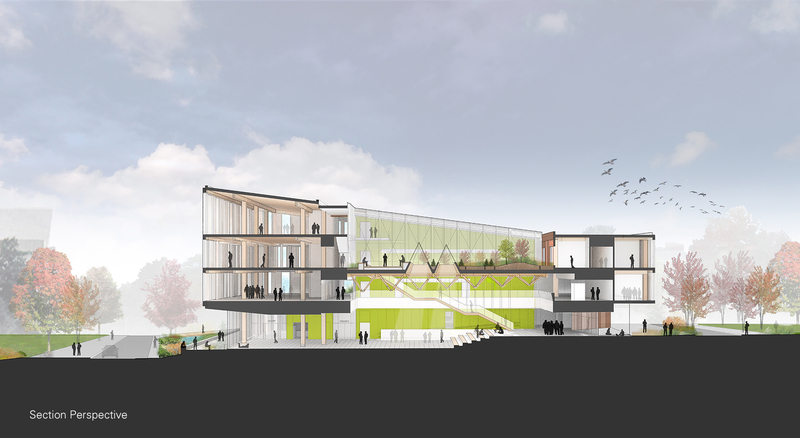 Also planned is a cafe, exhibit space, and libraries. The Design Building site is a sloped area on the southern part of the UMass campus between Stockbridge Way and Kevin Roche’s 1975 Haigis Mall. 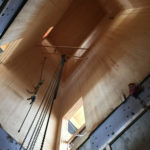 “It is a challenging site,” said Leers. 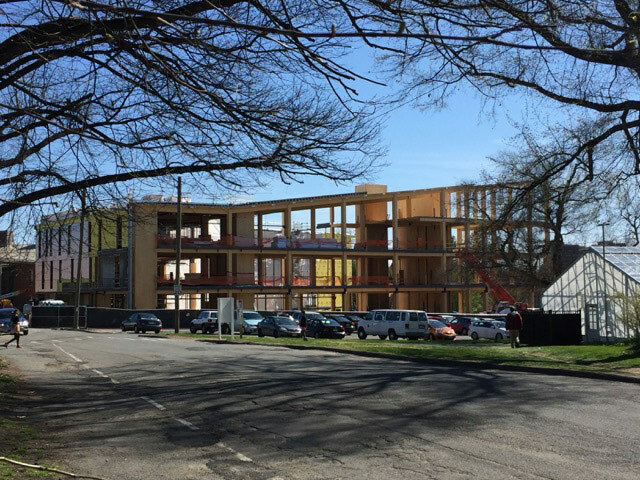 The building will rise to four stories on one end and three stories on the uphill. The landscape design by Stephen Stimson Associates relies on a bioswale for water filtration. 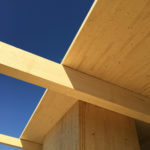 Leers Weinzapfel stressed the close connections between the exterior and interior, with the concept of building-as-landscape and landscape-as-building. In separate conversations with both Leers Weinzapfel architects and UMass building technology specialists, both emphasized the educational component of the Design Building—how the building itself would serve as a living instructional example. 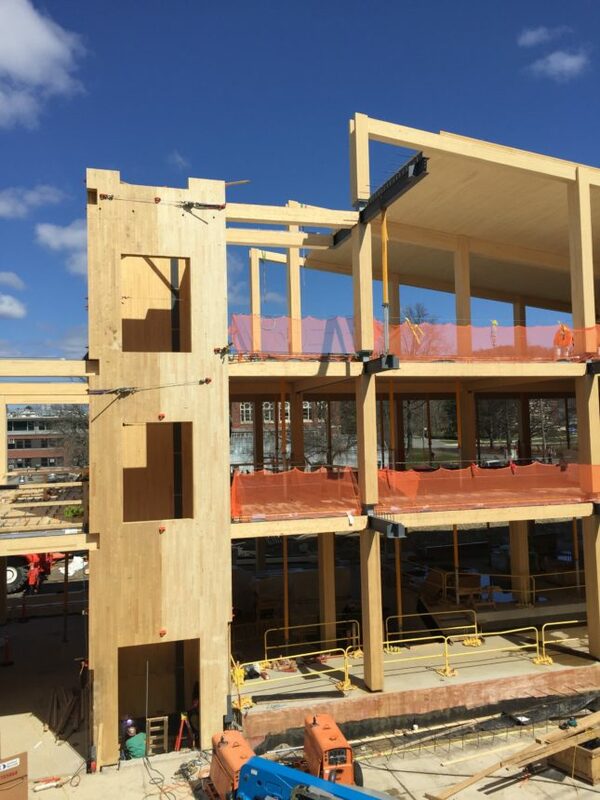 “We wanted this building from the early stages to be a teaching tool for advanced timber construction,” said Peggi Clouston, associate professor of building and construction technology at UMass Amherst. “The project uses CNC milled wood,” said Alex Schreyer, building construction and technology program director at UMass Amherst. 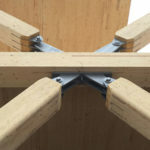 “There are extremely tight tolerances. 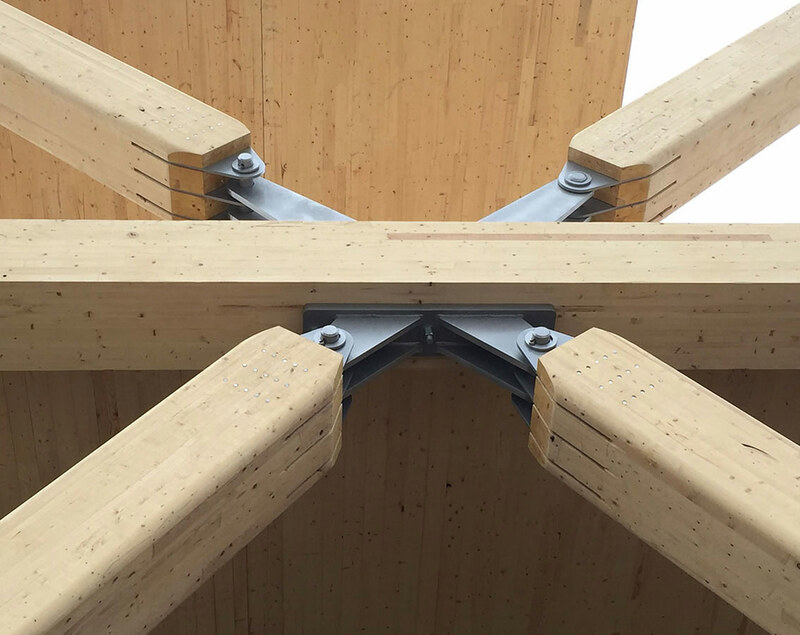 It’s innovative with these spans of 25, 26 feet.” But there are challenges to building in timber in the U.S. “The forests are in a state of decline. They are not properly managed, and weed species [smaller species] are choking out larger ones,” said Clouston. These weed species are easy fuel for forest fires. 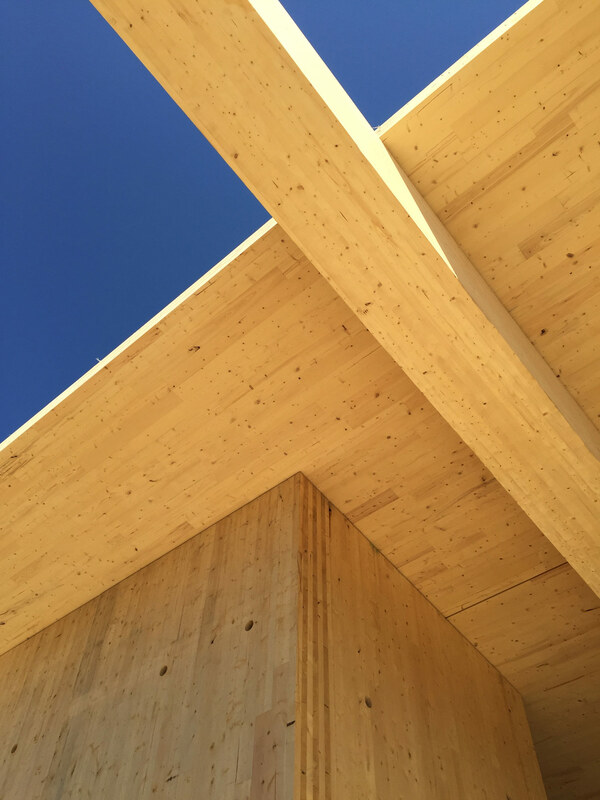 The use of mass timber reflects the university’s roots in agriculture—the university was founded under the President Abraham Lincoln-signed 1862 Morrill Land-Grant Colleges Act. The university was first called the Massachusetts Agricultural College. “It was a public process,” said Josiah Stevenson, principal at Leers Weinzapfel of the design. 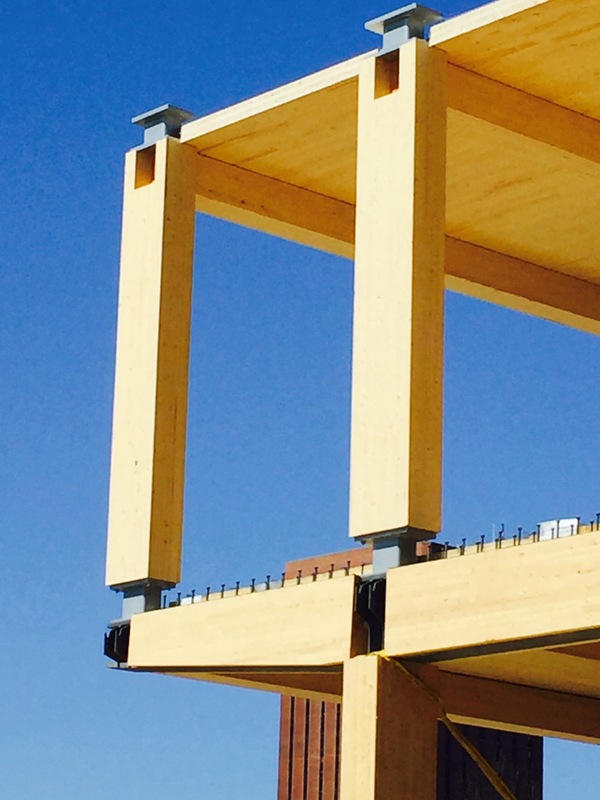 The total cost of the project is $52 million, with $36 million going toward construction. When it came to obtaining funding, the UMass’s efforts were partially an “activist intervention,” Leers explained. UMass faculty went to the state legislature for funding, and spoke with former Massachusetts Congressman John Olver. He was taken with timber, said Clouston. 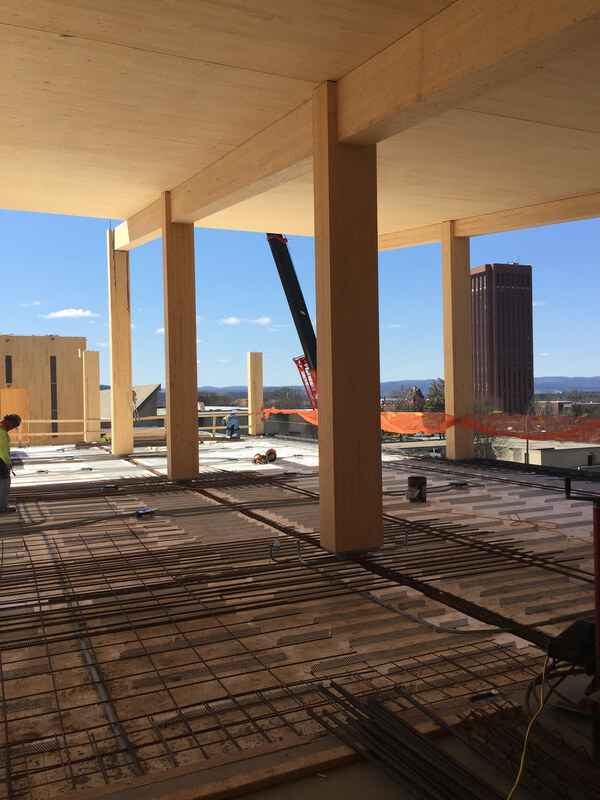 Currently down the hill from the Design Building site is Wood on the Plaza, a white ash timber bridge shell installation at the Fine Arts Center Plaza. 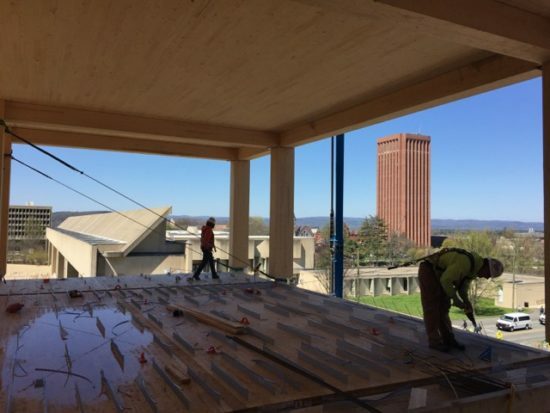 The architecture department will be moving out of its home in a Brutalist Kevin Roche building. The university will reuse the current architecture and building technology spaces, while razing the landscape department building, originally built as a dorm. 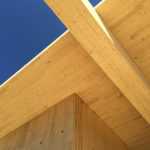 You can find more Design Building information, construction photos and time-lapse videos online. 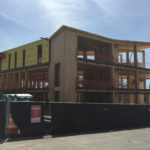 The construction manager for the project is Suffolk Construction.